A new report released by Nielsen on Thursday shows that Apple is the top smartphone manufacturer in the United States. [ad#Google Adsense 300×250 in story]According to the report, Apple leads all manufacturers with 28 percent of the market. HTC’s Android smartphones account for about 14 percent of the market and its Windows Mobile phones have an additional 6 percent. Motorola’s Android phones have about 11 percent of the market, while Samsung’s Android devices are used by 8 percent of smartphone owners. 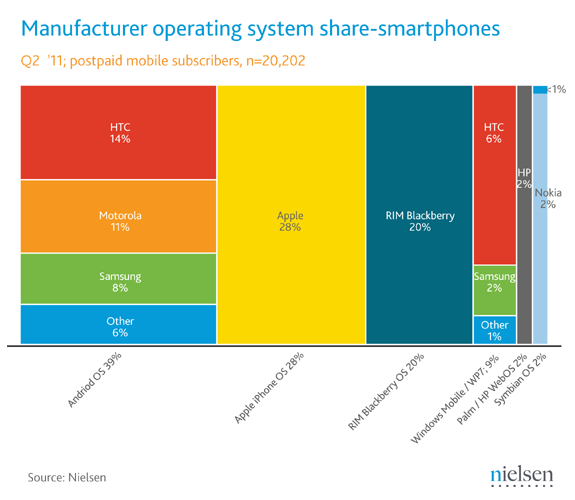 Samsung’s Windows Mobile phones are used by 2 percent of smartphone owners. When it comes to mobile operating systems, Android tops the list with 39 percent of the U.S. market and Apple in second with 28 percent. RIM has fallen to third place with 20 percent.